For the first time, astronomers have tracked the evolution of a pulsar's magnetic field over time, watching as it slowly tilts toward the dead star's equator. The new observations of the pulsar, located in the Crab Nebula, could offer clues to the long-standing problem of what slows pulsars' rotation. "Most pulsars are millions or tens of millions of years old," said Andrew Lyne, emeritus professor of physics at the University of Manchester in the U.K., who led the study, which appears in the Nov. 1 issue of the journal Science. "So we don't expect to see significant changes. But we have been looking at this for a substantial portion of its lifetime, some 40 out of 1,000 years." The supernova that birthed the pulsar in the Crab Nebula occurred in A.D. 1054. Chinese and Arab astronomers both noted it. A pulsar is the remains of a star whose core is at least 1.4 times as massive as the sun. When such stars reach the end of their lives, they can explode as supernovae. What's left is a neutron star, only a few miles across, with a large fraction of the star's original mass, which makes them incredibly dense. Since stars are already rotating when they collapse, the neutron star spins on its axis spectacularly fast — just as ice skaters spin faster as they pull their arms in. At the same time, the neutron star develops an intense magnetic field and emits a beam of electromagnetic radiation along the north-south axis of that field. The magnetic field's axis and the neutron star's axis of rotation aren't perfectly aligned, so the beam of radiation sweeps across space, like the rotating lamp of a lighthouse — a pulsar. If that beam happens to cross the path of the Earth, radio telescopes can pick up the signal. 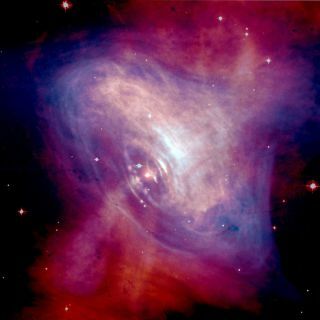 The Crab Nebula pulsar's signal flashes at about 30 times per second. The team from the University of Manchester and Jodrell Bank Observatory gathered 22 years' worth of data tracking the Crab pulsar's signals. The signal comes in two parts, a main pulse and a secondary one, called an interpulse. By measuring the polarization of the signal at two different frequencies, it's possible to calculate the angle between the axis of rotation and the beam of radiation. The researchers found that angle is increasing by 0.62 degrees per century. In the Crab Nebula, a rapidly rotating neutron star, or pulsar (white dot near the center), powers the dramatic activity seen by the Chandra X-ray Observatory. The inner X-ray ring is thought to be a shock wave that marks the boundary between the surrounding nebula and the flow of matter and antimatter particles from the pulsar. Seeing how quickly this happens might offer insights as to what happens in other neutron stars, Lyne said. One of the ongoing mysteries about pulsars is why they slow down as quickly as they do. The Crab pulsar, for example, is slowing by about 38 nanoseconds per day. "If pulsars were just rotating dipoles, we'd expect the slowdown rate to be proportional to the cube of the … rotational frequency," Lyne told SPACE.com. "We call that the braking index, and it should be about three But most pulsars are smaller than three. About two-and-a-half or so." The slow movement of the magnetic field might be the answer. "As the inclination angle gets larger, increasing the angle between two axes, it's almost exactly at the rate you need to cause the braking index to be two-and-a-half rather than three." It still isn't clear if that's the reason, however, because the internal structure of pulsars is still poorly understood. The new data also gave other insights. "Normally, magnetic fields don't move through superconductors," Lyne said. "This magnetic field is moving, which suggests the superconductor in the neutron star is not perfect." It's not likely that astronomers will run across another like the Crab pulsar, because to see one at all, the radio beam has to sweep across the Earth, and the odds of one being in precisely the right orientation are small. On top of that, the supernova that made the pulsar would have to be less than a few thousand years old, scientists say. There are several supernovas of the correct age, but they aren't all the right type to produce pulsars, and even if they were, they aren't pointed the right way. It still isn't completely clear why pulsars' magnetic fields look as they do. "I wouldn't class it as being a simple problem," Lyne said. "We're trying to understand why it should evolve in this way."